Putting together this week's Roundup just made me jealous. Today's high is supposed to be 94 in Sacramento and you guys are out there (in places where you actually have seasons) making yummy Fall soups and stews. Whatever. 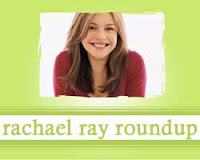 Mediaweek informs us of a promotion from Every Day with Rachael Ray if you use ScanIt!. Jessica of The Weeknight Gourmet made Cacciatore Stoup with Turkey Meatballs. Krista of Krista Kooks made Pasta, Peas and Ricotta Fake-Bake. Tiffany of Eat at Home adapted Rachael's recipe for Broccoli Mac and Cheese. Reminded me that I need to make this for Darcy! Kelly of Faithful Provisions made Rachael Ray's Chicken Mug Pie - a perfect recipe if your weather is starting to cool down (unlike here in Northern California). Lisa of Lime in the Coconut made Memphis Style Baby Back Ribs from Everyday With Rachael Ray. Tart Reform features a recipe perfect for a camping trip - Pesto Chicken Grill Packets (I made them recently and thought they rocked, too). Shannon of Shannon's Cookbook made Rachael Ray's Pasta with Spinach, Artichokes, Bacon and Cherry Tomatoes. Sarah of No Whey, Mama made Homemade Chicken and Stars Soup from Comfort Foods. Jennifer of Tatertots and Jello made Caramel Coconut Fudge Brownies from Rachael Ray's magazine.